...... evenly and fairly as possible, while respecting work association preferences. You can schedule completely manually, using the drag-and-drop interface, completely automatically, or any combination in between. SmartRoster offers a number of features to make sure people get their schedule, and remember when they are on duty, such as individualised reports, direct email to your volunteers, and automated email reminders. 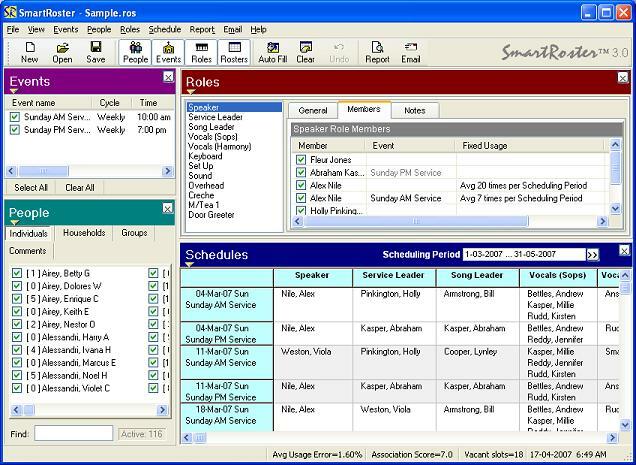 SmartRoster eliminates clashes and mistakes. SmartRoster maintains a knowledge-base about your people, their skills, absences and work constraints, as well as your organisations requirements. - Schedule from days to years - there's no limit! Qweas is providing links to SmartRoster 4.0 as a courtesy, and makes no representations regarding SmartRoster or any other applications or any information related thereto. Any questions, complaints or claims regarding this application SmartRoster 4.0 must be directed to the appropriate software vendor. You may click the publisher link of SmartRoster on the top of this page to get more details about the vendor.